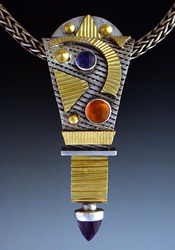 Beads silver & gold 1. Handmade designer beads and slides. 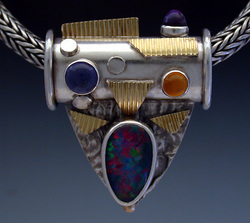 statement beads and slides, modern style beads and slides, One of a kind silver & gold beads and slides, beads and slides set with mixed gemstones. 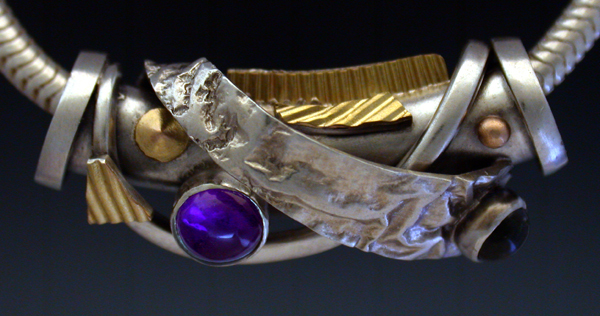 Materials: Sterling silver and 14k gold. 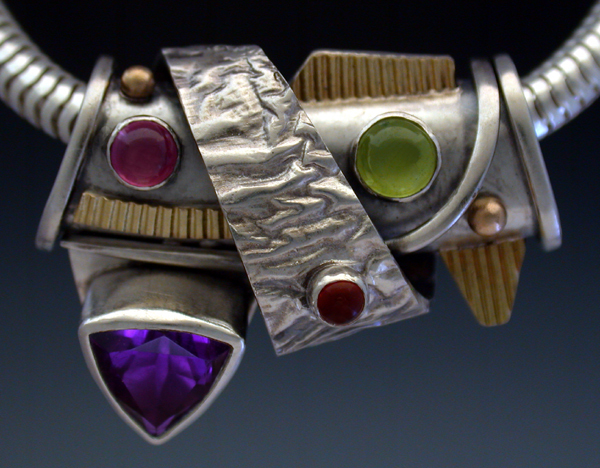 Set with: Peridot, Amethyst, and Iolite. 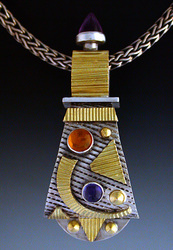 Note: The chain is not include in the price. 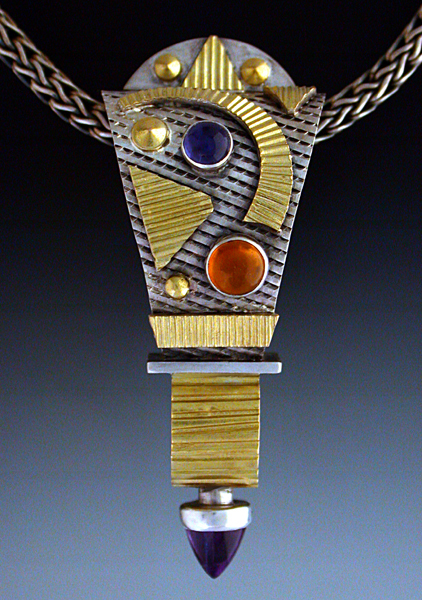 Materials: Sterling silver and 14k gold. 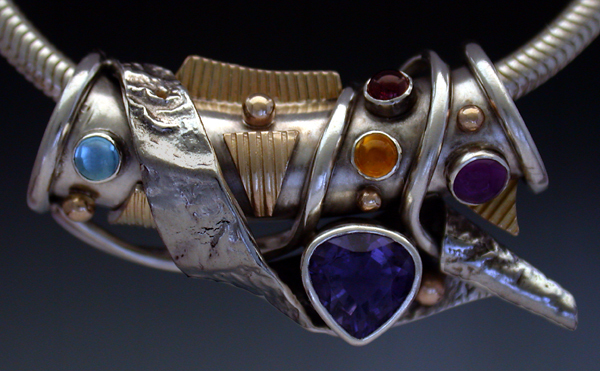 Set With: Amethyst, Peridot, Iolite, Garnet, Honey Citine, and blue topaz. 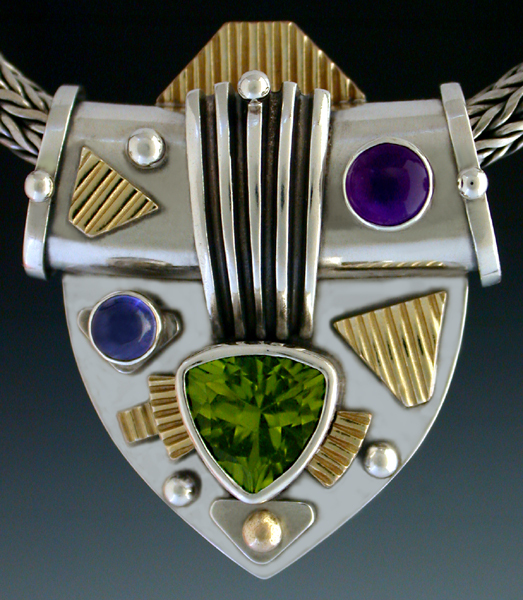 Dimensions: 1" x 3/32" x 3/4"
Materials: Sterling Silver and 14K Gold set with Green Tourmaline and Amethyst. 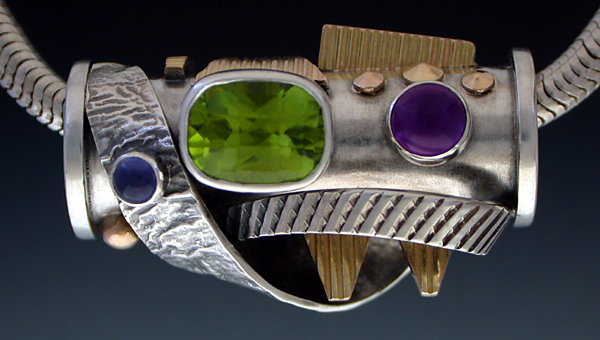 Dimensions: 1" 3/8 x 3/4"
Materials: Sterling Silver and 14K Gold set with Peridot, Amrthyst and Iolite. 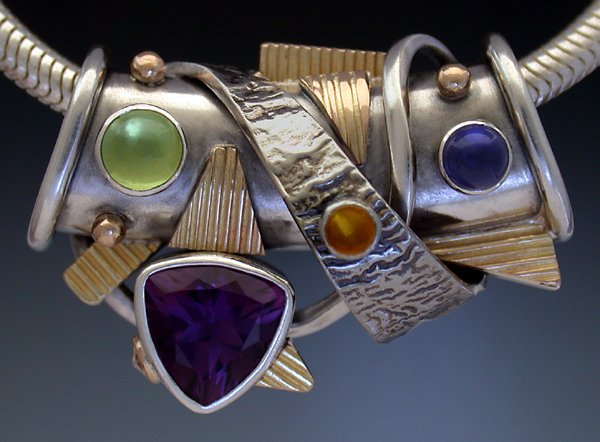 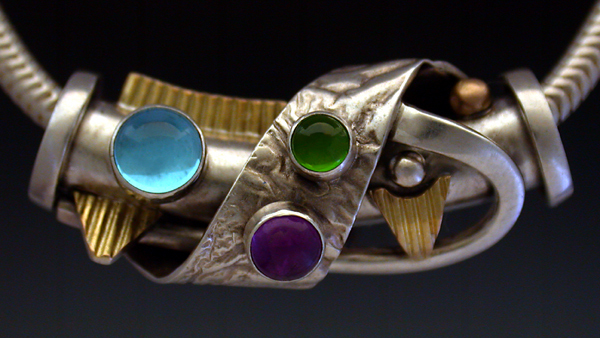 Dimensions: 1" 5/16 x 7/8"
Materials: Sterling Silver and 14K Gold set with Amethyst, Peridot, Iolite and Citrine. 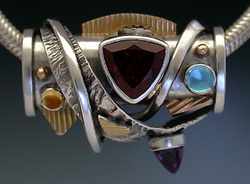 Dimensions: 1" 9/16 x 3/4"
Materials: Sterling Silver and 14K Gold set with Iolite, Amethyst, Blue Topaz, Garnet and citrine. 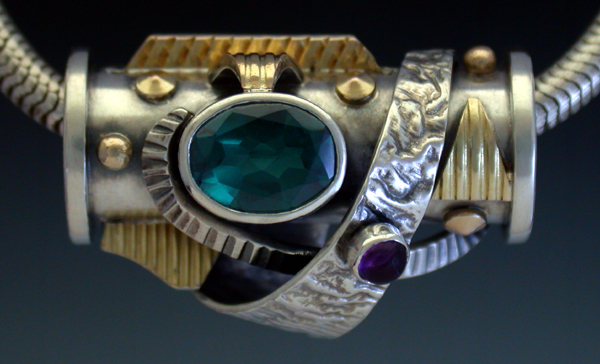 Dimensions: 1" 1/4 x 9/16"
Materials: Sterling Silver and 14K Gold set with Blue Topaz, Amethyst and Chrome Dioxide. 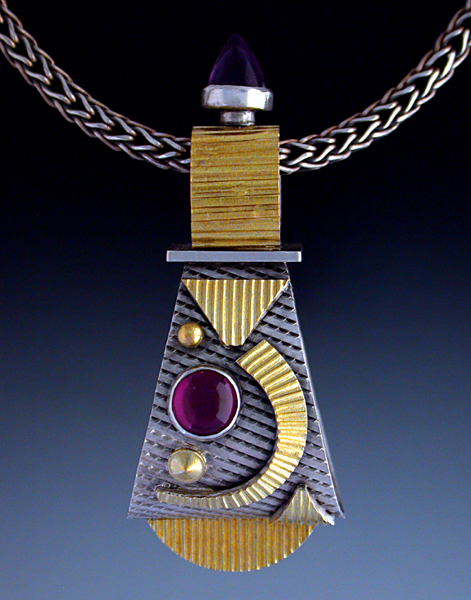 Dimensions: 1" 3/16 x 1/2"
Materials: Sterling Silver and 14K Gold set with Amethyst and Chrome Dioxide. 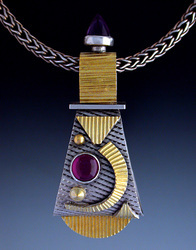 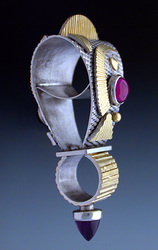 Dimensions: 1" 1/8 x 15/16"
Materials: Sterling Silver and 14K Gold set with Garnet, Blue Topaz, Amethyst and citrine. 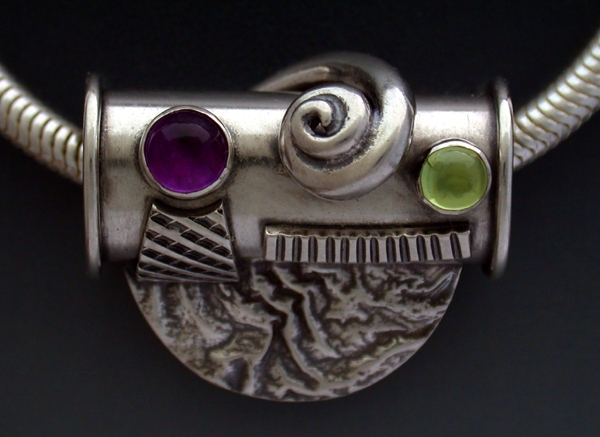 Dimensions: 1" Long x 13/16"
Materials: Sterling Silver, set with Amethyst and Peridot. Dimensions: 1" 5/16 x 1"
Materials: Sterling Silver and 14K Gold set with Amethyst, Peridot, Garnet and citrine. 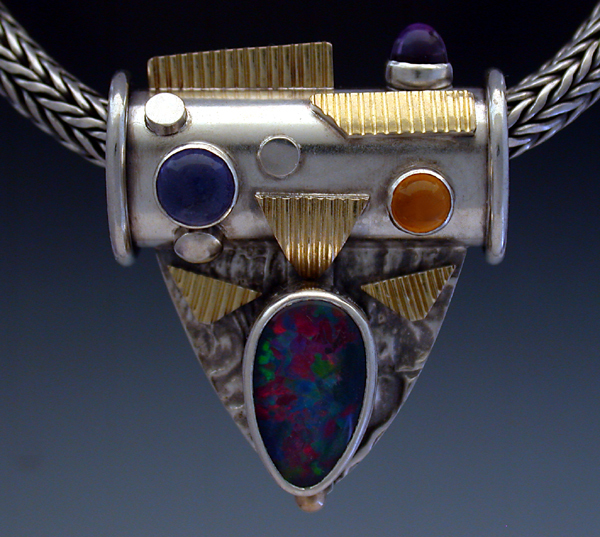 Materials: Sterling Silver and 14K Gold set with Triplette Opal, Iolite, Citine and Amethyst. 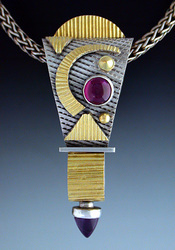 Description: This one of a kind Bead / Pendant is reversible and can be worn up or down. 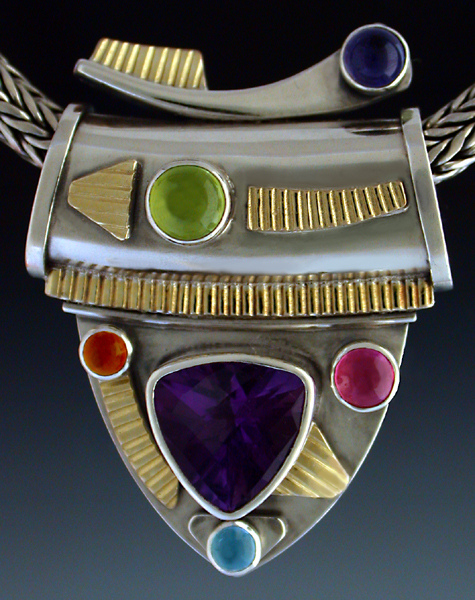 Dimensions: 1" 15/16 x 13/16"
Materials: Reversible Bead: Sterling Silver and 14K Gold set with Jamuni Garnet, Amethyst Bullet, Citrine and Iolite.